National Climatic Data Center (NCDC) Climate Division (cirs) data is updated within the first 10 days of the following month. This monthly climate data listing accumulated precipitation and monthly mean temperature may be accessed directly from NCDC, a division of NOAA in the US Department of Commerce. For convenience we provide the most recent data here for each of the 344 climate divisions in the continental US. The original ASCII (plain text) data files from NCDC begin January 1895 and are each approximately 3.5Mb files. This monthly climate division "cirs" data firms in three steps: the first step as reported here within the first ten days of the current month, a second step reporting usually within the last ten days of the current month, and a third step and usually final firming that occurs five to six months later. 20121114. Texas A&M University's State Climate Office generates a FNEP precipitation data set on the same NCDC-CIRS climate division spatial basis but with a different station composition. Both datasets begin 189501. FNEP updates occur on a non-regular basis; consequently the CIRS data is updated here on a monthly basis. Dynamic Predictables beginning 201201 uses the FNEP precipitation data base because of the considerably higher accuracy obtained with the DynaPred Atlas First Stage Model using the FNEP precipitation(Predicting from FNEP, Scoring from FNEP). FNEP input data 1st Stage Model predictions also score marginally better against the NCDC-CIRS observed than does the Predicting-from-NCDC-CIRS, Scoring-from-NCDC-CIRS procedure. Pearson Correlation Coefficient as commonly used in spreadsheets including MS Excel was used in the comparison. 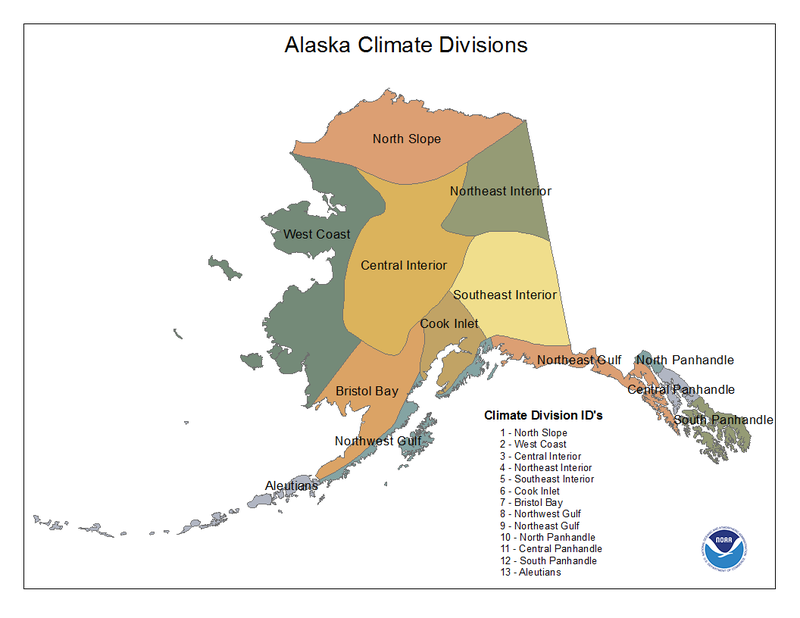 At NCDC, Climate Divisions of interest may be located with a combined numeric state code, climate division number, and climate variable code: StCdV with SS ranging from 1 to 48 (50 Alaska added 20150306), Cd ranging from 1 to 10, and V being 1 for precipitation and 2 for temperature. Near page bottom a green US state map is available courtesy US Government Census Bureau. Then courtesy of NOAA's Climate Data Center (CDC), next down is a GIF map may help individual climate division location, followed at bottom with Alaska map. Please open or download these .TXT files to update your data (200001-CPCprelim for the nClimDiv gridded time series on same ncdc-cirs spatial regions) and charts. Note with 201502 nclimdiv adds Alaska's 13;US total moves fm 344 to 357. 20160620: added Tmindv from NCEI (formerly NCDC), increasingly regarded as less accurate component of tmp=(tmax +tmin)/2. Consequently tmax sometimes used separately or in replacement of tmp. 20140623. NCDC beginning with 201405 data releases Tmax and Tmin on their own and in derived products CDD, HDD, etc. Details at ftp link below and other NCDC sites. 20151127: Clarification the downloadable file above is for nclimdiv's ctmp series meaning the monthly Mean not Tmax or Tmin. Perhaps main effect arises from mountainous area contributions to cooler and wetter temperatures and precipitation, respectively, than in previous CIRS time series. DynaPred retains the same nomenclature, e.g., 201402pcpUS because the individual climate divisions remain unchanged; the 'filling' data has changed. 20131226. ###ALERT: DATA CHANGE. NCDC has announced 201312 will be last discrete-station based ncdc-cirs series. Beginning 201401 data this climate division series becomes based upon 5km square grids. More... follow link examine Future Dataset and Discovery Tool for comparisons. 20110905. DynaPred with 201107 end data adopts the 200703 I2I2I2I4 FORMAT. If you've been using the previous format, it will probably work in Excel but any machine reading of formats would need to adjust the Read input statements from I2I2I1I4 to the NCDC's 200703 I2I2I2I4 input metadata format. ###ALERT: EFFECTIVE MARCH 2007 NCDC-CIRS DATA ADOPTED AN ADDITIONAL DIGIT VARIABLE FORMAT. Spatial and climate identifiers beginning in leftmost column 1 changed from StCdVyyyy to StCdVVyyyy. This format change is readily compensated for manually while importing .TXT files into a spreadsheet such as MSExcel. However, if you're reading this text (ASCII) file into another processing program such as Fortran, C++, etc. then almost all your input READ files formats will need to be changed accordingly. Beginning with the 5th column first variable (V to VV), then yyyy, and then all the climate variable (e.g. temperature or precipitation) data fields have been shifted one (1) digit to the right in a tabular, ASCII format. Illinois 2003 precipitation, climate division 6, would be left headered by 110612003 where 11 is Illinois (IL), 06 is NCDC climate division #6 and precipitation is climate variable 1, followed by CY 2003. The twelve columns to the right of the indicator set are the monthly precipitation values (January = 1, February = 2, etc). Monthly accumulated precipitation is in inches, with missing data indicated by -9.99. September 2003 (200309) is then 2.60 inches. North Dakota 2003 monthly mean temperature for climate division 4, is indicated by the first nine digits on the left: 320422003 where 32 is North Dakota (ND), 04 is NCDC climate division #4, temperature is climate variable 2, followed by CY 2003. Monthly mean temperature (simple average of the daily midpoints during the month) in degrees Fahrenheit (F) for September 2003 (200309) is then 59.70 F. Missing data indicator is -99.90 or -99.9.